Zach "Snacks" Norvell is Gonzaga's version of Vinnie "The Microwave" Johnson (Google him) so far this season. Just ask Josh Perkins. A major reason for Gonzaga's success last year was in the team's ball movement and selflessness. Five guys averaged double digits and the team averaged 15.25 assists per game. Though early in the season, the Zags have built off of that stapled play and now have six guys averaging double digits (Rui Hachimura isn't far off with 9.8 points per game) and the team averaging a whopping 18 assists per game. That selfless play can be found throughout their roster, notably with freshman big Jacob Larsen, who is averaging 1.3 assists in a very limited 11.9 minutes per game. Comparatively, Przemek Karnowski was heralded for his passing ability, averaging 1.9 assists in 23.1 minutes per game. Larsen shows the promise to be every bit the passer and a major face-up defender in the Zags defense, averaging nearly a block every game. He also seems to be the linchpin for Few's deployment of the 2-3 zone. That zone style — when not facing great shooters like those found on the Creighton Bluejays — is stout and seemingly unbreakable when you have long, athletic wings and post players spacing the half-court. Guys like Larsen, Johnathan Williams and Killian Tillie are how the Zags have become one of the better defenses in the entire country. After Friday night's victory and holding Creighton to 48.3 percent field goal shooting, Gonzaga now has held opponents to below 50 percent for 64 straight games. And while there has been lapses in perimeter defense, credit is due for how the team adjusts and approaches the second half of games. Creighton entered halftime with a seven point lead, and was 7-for-14 in three-point shooting and 58 percent from the field. Tillie is quietly having himself a fantastic sophomore campaign, acting as cleanup crew for an offense that demands diverse player usage. Tillie's blocks and attentive defense has led to runs in more games than just Friday's, where he singlehandedly thwarted Creighton in three straight possessions. Williams should expect more of the defensive looks he saw against the Blue Jays, who would double and provide help for whoever would have to meet him as he got the ball on the shoulder. Zach "Snacks" Norvell continues to be an absolute delight to watch get going. After a rough 0-5 first half, the redshirt freshman dropped 21 points in the second off of 87.5 percent shooting. "He's a walking bucket," Josh Perkins said after the game. "He's a microwave. When one goes in... there's more coming. He's a confident guy and once the lid gets pulled of for him, the hoop is a pool and you saw that tonight." Norvell seems to be sliding into the utilitarian threat that Few and the staff desperately needed. He's spent time in major minutes at both guard positions and the wing spot. While Wade continues to integrate into the program, Norvell has been the de facto backup guard to spell Perkins. His motor is admirable, as he tries to progress his game through attacking the basket while waiting to warm his jump shot up. However many years we get of him will be a treat. The Zags now head to New York City to play Villanova, who seem undervalued as No. 4 in both the AP and Coaches Poll. 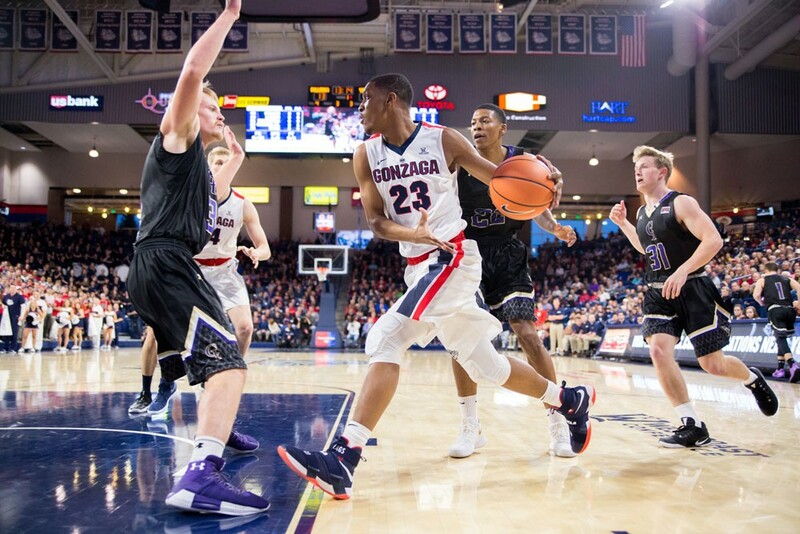 The Wildcats will prove to be yet another test for the Zags backcourt. The team's four leading scorers are all guards, led by juniors Mikal Bridges and Jalen Brunson. Bridges and Brunson have hit an absurd 67 percent of their shots inside the arc and 51 percent outside. While the Zags are out of town this week (they face the Huskies in Seattle on Saturday), Kennel Club members and bold season ticket holders have plenty of time to secure their necessary attire to fulfill the #RobeGang dress code. Perkins' affinity for the loungewear seems to have caught on, with a handful of students wearing robes all the way up to shoot around.